This summer John and I went to Indonesia. I know, random place to go, but our friends live in South Korea and were going to Bali (Indonesia) for vacation and invited us along. Because of all our free airline miles, we thought “what the heck, let’s go to Bali.” And so we did. And behold, that is where I stumbled upon perhaps the cutest little coffee/food/gelato cafe I’ve ever stepped foot in: Sea Circus. Another reason I loved this place? They had BACIO (chocolate-hazelnut) gelato that was rich and chocolaty and intense with hazelnut flavor thanks tiny bits of hazelnut blended right into every bite. It was intense. Ever since I slurped down that bacio gelato cone I could NOT shake the idea of making chocolate-hazelnut cookies from my mind. And so to the kitchen I went to test. After one raw batch and one baked, I heavily preferred the no-bakes. I mean, 4 ingredients, no butter or sugar or baking, AND they tasted better? It was kind of a no-brainer. 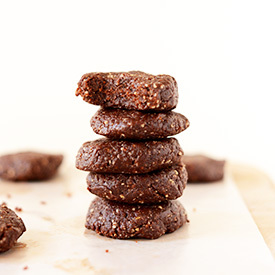 These cookies require just 1 bowl, 5 minutes and 4 ingredients, meaning they fit ALL THREE requirements for the recipes on this blog. A trifecta of simplicity, if you will. But that doesn’t mean they skimp on flavor or texture one bit. The dates provide ample sweetness and fudginess. The cocoa powder gives them that slightly bitter chocolate taste. The hazelnuts add that essential nuttiness & “bacio” profile. And semisweet chocolate chips add yet another layer of chocolate decadence. This humble cookie is kind of my bliss. Now, if I could only get back to Sea Circus sometime for another scoop of bacio gelato, then my bliss tank would be all the way full. 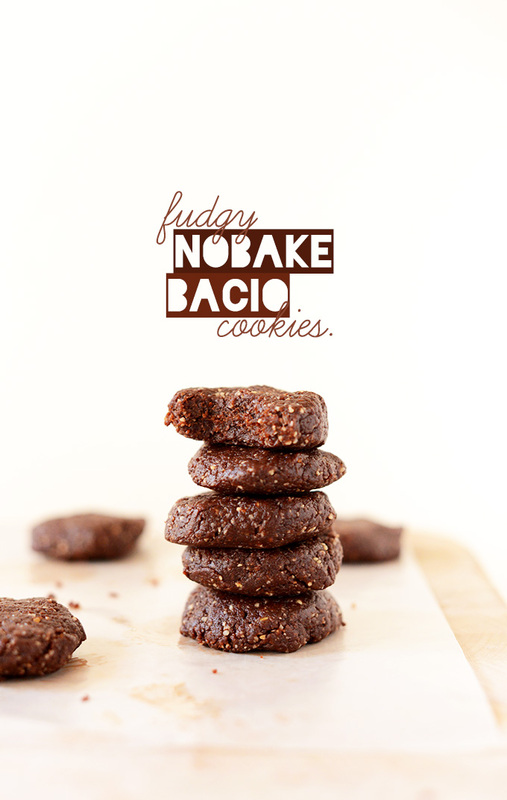 Until then, let them eat bacio cake cookies! 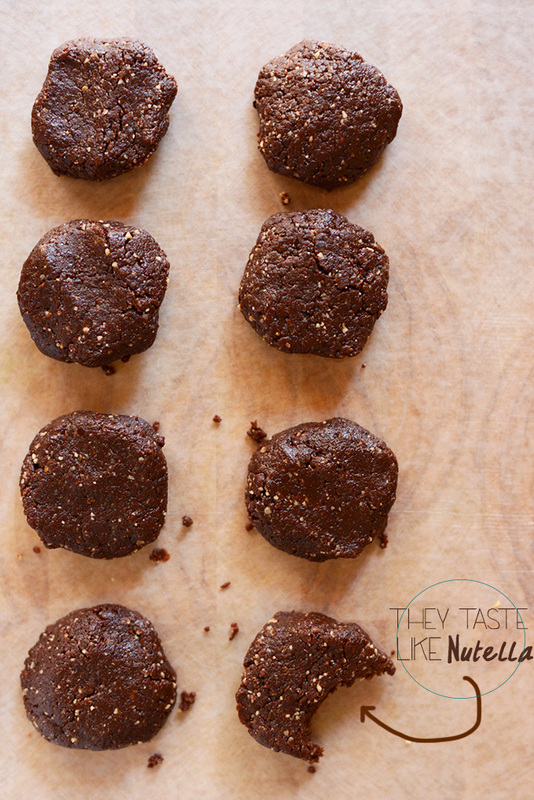 Simple 4-ingredient chocolate hazelnut cookies. 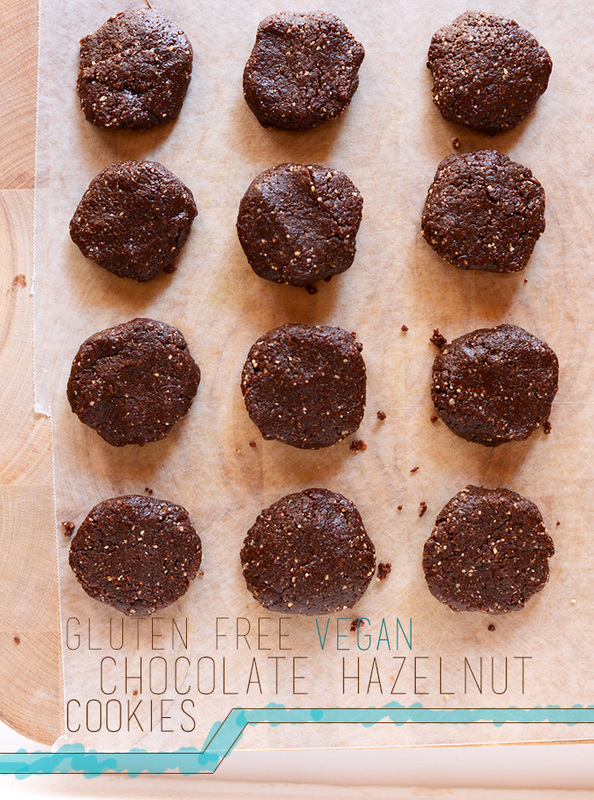 No baking required, plus vegan and gluten-free. So fudgy and they taste like Nutella. WHOA. 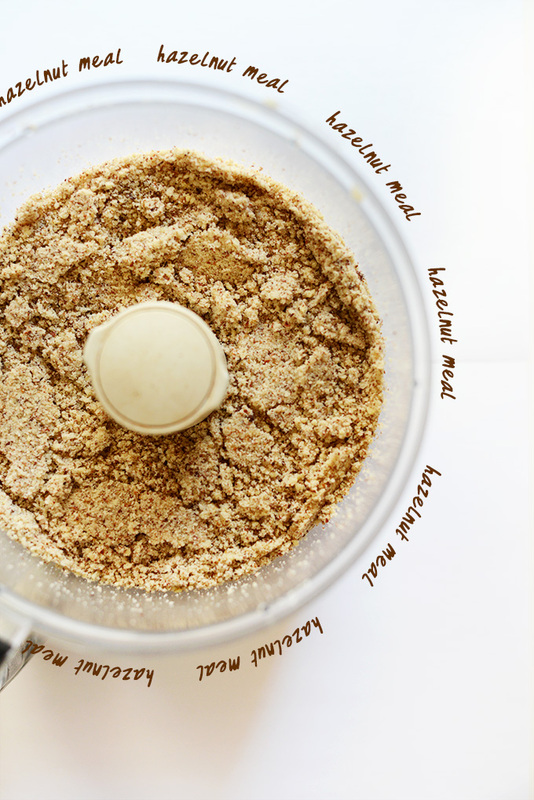 Add dates to a food processor and pulse until small bits remain - it should form a ball, but not a big deal if it doesn't. Add chocolate chips, cocoa powder and hazelnut meal and mix until well incorporated (see photo). 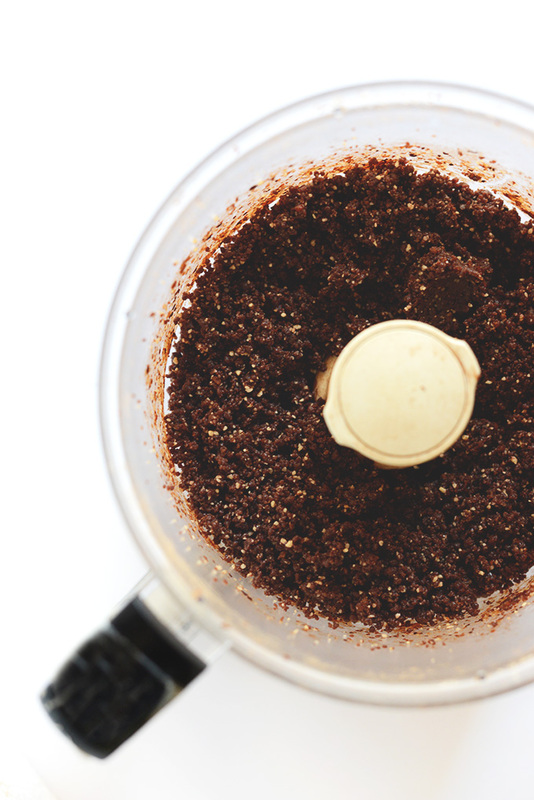 Add more dates through the spout while mixing if it appears too dry. You know you have the right texture when you gather a small amount in your fingers and it easily forms a dough. I added a few more to get that perfect doughy texture. Form into 1-inch discs and eat immediately. To store, refrigerate in an airtight container or bag; freeze for longterm storage. *You could easily make these into bars by shaping them into a 1/2-inch tall square in an 8x8 pan and then cutting them into bars or "brownies." My grandchildren and I love your 3 ingredient cookies. I use 9 me dojo dates for the 3/4 cup measurement. The chocolate hazelnut cookies are giving me trouble. I tried twice using almonds. I went up to 15 dates, and the mixture still didn’t want to stick together. But, they are also delicious! Do you have a suggestion? Do you think the dates become dried out? Hmm yes, it sounds like the dates may have dried out.. let us know if you have success with fresher dates in the future! We’re so glad you and your grandchildren enjoyed our 3-Ingredient Cookies, Lou! xoxo! How much grams has 1 cup of hazelnut meal, do you know? Thanks! … And how about 1 cup medjool? Sorry, I forgot to mention dates! Thanks! Same grams to cup no matter what is in the cup! Hi Dana – In place of the dates do you think this will turn out just as good with maple syrup or honey? Hi Lanasia! I wouldn’t recommend swapping the dates for syrup or honey as the dates are what really bind these cookies together. Hope this helps! Eyeballed enough dates and hazelnuts at the store to make two recipes. This left me without quite enough dates to smooth it up (it seemed a little dry with the dates I had). Instead of using extra dates (as I didn’t want to use up the ones for my second batch), I used some chocolate almond milk I had instead. Just a splash worked wonderfully! Just made these, they were delicious!! But i put the mixture in the microwave for 1 minute and they were literally insane, definitely recommend eating them hot! I also used cacao powder which i think gets activated more when heated. Thanks for a brilliant recipe! These cookies/ brownies were so good I ate half of it by myself. I used dutch processed cocoa plus 2 tbs coarsely ground cacao nibs. Next time I may roast the hazelnuts and add a flax egg. But as is, it’s still unbelievably good. Great Cookies! Made them last night. My 3.5 year old and husband are hooked! Ohhh, Bali, how beautiful. It is one of my mum’s favorite place. Chocolate + hazelnut is totally the best combo ever. i love chocolate and hazelnuts! I also LOVE your pics and the wonderful text you add to them. So clever! I’ve always dreamt of visiting Bali. It’s such a magical place! I love this recipe! And funny enough I just made tonight no bake almond cookies! Your pictures are amazing. Obsessed with the design and text on these photos. NICE WORK DANA you are so talented :) Plus- the recipe looks divine! First of all, I am so jealous of your trip! Sound so fun! Second, the cookies are awesome! Nothing beat 4 ingredients, no bake and chocolate!